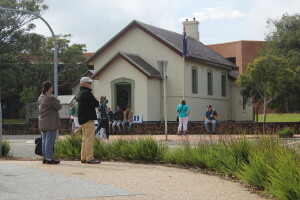 The Courthouse is used as a tourist information centre for the northern region of the Mornington Peninsula. Members of the community voluntarily staff the Courthouse, and they share their knowledge and passion of the peninsula with visitors to the Courthouse. The northern region has been a popular tourist destination for many years. Historical sites, sheltered sandy beaches, and family attractions continue to be enjoyed by day trippers and holiday makers alike. The friendly atmosphere and diversity of the boutique shopping in Mt Eliza, Mornington, and Mt Martha are all part of the attraction. NMPT is represented on the Mornington Peninsula Tourism Board, giving the NMPT members a say in how tourism on the peninsula is developed. The Courthouse is open Monday to Friday from 11am to 3pm, and Saturday and Sunday from 11am to 4pm, open every day other than Good Friday and Christmas Day.